Shōnishin Japanese Paediatric Acupuncture for babies and kids – A quick treatment for babies and kids that does not use needles. 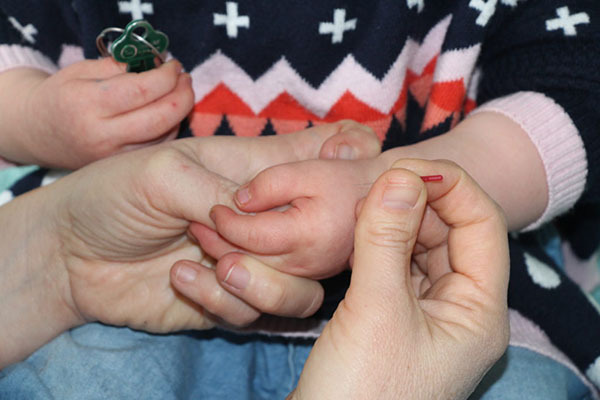 Shōnishin is a non-invasive form of acupuncture developed specifically to respond to the needs of babies and children. Instead of needles gentle stimulation all over the body is performed with a tool (see the pictures below), by different stroking techniques. In addition to the stroking techniques, different tapping techniques are used in certain areas and vibration techniques on acupuncture points. Tuina – Chinese massage and acupressure treatment along the bodies meridians and on specific acupuncture points. NST – Bowen Therapy – a therapeutic treatment for all ages. See the NST – Bowen Therapy page for further information. Shōnishin may be able to help manage symptoms often associated with newborns suffering from reflux, colic, KISS syndrome, feeding difficulties, abdominal pain, developmental problems or even excessive crying. Shonishin and Acupuncture may also be able to help manage the symptoms often associated with headaches, neuro-dermatitis, eczema, allergies, asthma, colds and flu, bed wetting, teething, posture, growing pains and a range of sleep, digestive and behavioural issues (ADHD and concentration problems). 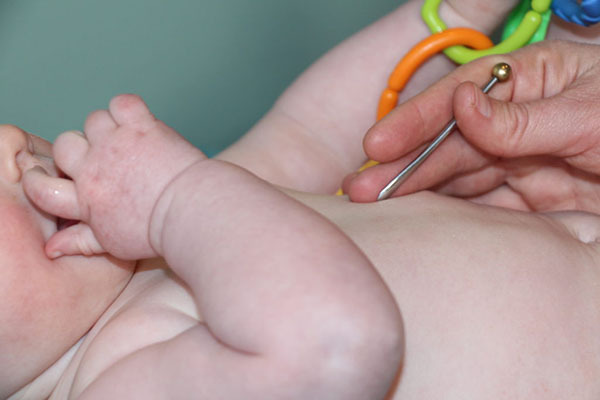 Sometimes tiny needles are used but always at the discretion of the practitioner and parents. This baby is being treated with the spinal roll technique. Common in traditional Chinese Tuina for children of all ages. Parents are taught this to do at home daily, it is used for many conditions and general well being maintenance. Done properly it is painless and relaxing. The pictures above are of a baby having a Shonishin treatment. The non sharp tool is an ‘Enshin’, one end is used to glide along the skin (meridians) and the other round end is used for gentle tapping and vibrations on acupuncture points. A toddler having an acupuncture ‘TAP’. The needle is so tiny that you can barely see it. 0.16 mm x 15 mm long. These are used sometimes on children on certain acupuncture points, ‘TAPPED’ in via a short plastic quide tube and pulled straight out.